WHO lifted Ndigbo when they were down? Yes, the once vibrant tribe of Nigeria was devastated, humiliated and down after the civil war that did not only claim millions of their lives but also appeared to have eroded their destiny. They lost the war of secession, the war to have their own nation called Biafra, the land of the Rising Sun. And in the wake of the defeat followed a policy that so humiliated and further impoverished the Igbo man that he almost lost his identity. The policy added salt to injury as they say. Igbos who had hundreds of thousands or millions of pounds in their accounts before the war broke out, lost them. A Federal Government policy announced 20 pounds sterling refund to every Igbo account holder, the amount he had in his account before the war notwithstanding. The Igbo man lost the war and also, all his money to the Federal Government of Nigeria. He was seemingly down and just hanging on the fringes of life. But gradually, his Nzogbu Nzogbu Enyimba, Enyi philosophy found expression in a football club that arose from the ashes of the war to reign as champions, recording victories that assuaged their battered ego. The football club gave them some identity and became a movement of the people. That club is Enugu Rangers, also known as Rangers International. Rangers were more than a football club to the Igbo man. From Cyril Okosieme to Emmanuel Okala, if a Rangers keeper had the ball, it seemed he shouted, while kicking the ball, ‘on your mark, set, go‘ and the players would be running on opponents like Cheetah. Without so much finesse but with dogged determination, they won matches and matches and became the identity of the Igbo people. Till date, they remain a reference point on how leaders can use sports to mobilise and unite their people. Segun Odegbami has not stopped eulogizing the spirit of the Igbo man with reference to Enugu Rangers. He played against them and with many of them in the Eagles, he should know better. When the military returned to the barracks to usher in the Second Republic in 1979, all Jim Nwobodo needed to be governor of the old Anambra State (now Enugu, Ebonyi and Anambra) was his profile as Chairman of Enugu Rangers. And he was a very popular governor for that matter. Barely one year after the war, Rangers won the Amachree Cup which took the place of the national league on adhoc basis. It was the first and the last of the Cup. That opened the flood gate. They won the FA Cup in 1974, the double in 1975 and in 1976. Then they won the league and Africa Winners Cup in 1977. They were to win the double again in 1981 and the league in 1982. Rangers won the Challenge Cup in 1983 and the league in 1984. And after that, they died. Rangers began to womble and fumble (apologies Fanny Amun) and for more than 30 years, never celebrated any silverware. The once famous Nigerian side became the whipping objects of Nigerian football. Management was poor and players were not well remunerated. Those who governed the state never cared about the movement of the people as once symbolised by the Flying Antelopes called Rangers. Once, this reporter was privy to Rangers players contributing to fuel the bus that took them to a league venue. On another occasion, Rangers played a match with dirty and smelling jerseys as they could not pay for laundry services. They were so poor and only that spirit of Enyimba Enyi kept them in the premier league. But the dark days of Rangers ended with the coming of Ifeanyi Ugwuanyi as governor of Enugu State. Today, Enugu is celebrating a man who has tried to identify with the poor; a man who has kept an eye on healthcare, social infrastructure, rural development, a man of peace whose achievements were considered good enough to earn him Vanguard Governor of the Year Award. But in all these, Ifeanyi Ugwuanyi stands out as the man who revived and lifted that identity that gave the Igbo man a name after the civil war. It’s a thing the people are emotional about. If you were at the Nnamdi Azikiwe Stadium in Enugu when in 2016 Rangers beat El-Kanemi 3-0 to lift the League Cup 32 years after they last did so, you would appreciate Ugwuanyi’s place in the hearts of Ndigbo. They now call him the Jinx Breaker. It turned into a carnival. The crowd was unprecedented. The stadium struck you with sparkling white and dazzling red, the colours of the club. When they hit in the first goal, from one corner of the stadium fans started singing: Holy, Holy, Holy, Holy, Enugu Rangers, Another Champion, Holy Holy … tears rolled down many cheeks. It was emotional. Those who contributed to this victory turned heroes of the people. From the coaches, to the officials and the players, they were all revered. Ugwuanyi led the team. He carved his place in the hearts of the people. He saw to it that players’ welfare was not compromised. He championed their revival and to a reasonable extent, that never-say-die identity of the Igbo man as symbolised in Rangers. This achievement was still in the air when last year, Ugwuanyi led Rangers again to win FA Cup in Asaba. They were 3-0 down against Kano Pillars but that Enyimba Enyi philosophy, that never-say-die spirit propelled them into unprecedented FA Cup final comeback. They won on penalties. Another diadem within two years, all under Ugwuanyi. To Enugu people, as far as Rangers are concerned, Ugwuanyi is a winner, the man of the people, a Daniel Come to Judgment, as Shakespeare would put it. Aside his Rangers feat, there were other achievements that Vanguard Editors considered before electing Ugwuanyi as Governor of the Year. Among them is his passion for peace. Ugwuanyi is one politician even his opponents find difficult to disparage. They respect him for his initiatives for peace. His craving for peace informs the peace that reigns today in Enugu. Even when Fulani herdsmen raised their heads in some quarters, Ugwuanyi opted for peaceful resolutions. His liaison with security agencies has helped in policing Enugu hugely. He has made members of his cabinet one family. His deputy, Lolo Cecelia Ezeilo talks about his tremendous qualities all the time. He has made the entire state almost a team. Even those who have grudges are calmed by his good nature. It is unfortunate that Nigeria has been so misgoverned that when salaries are paid, it is counted as achievement. In the Nigerian context, therefore, Ugwuanyi would be scored well in the area of remuneration for workers. Nigeria Labour Congress adjudged him labour-friendly. He has been winning awards and being endorsed here and there for his achievements which now appear to be some tonic for him. Enugu State was rated by the World Bank Group as the second most advanced state in Nigeria in Ease of Doing Business, commending their frontiers of global good practices under Ugwuanyi. Enugu State workers have continued to receive their pay on the 23rd of every month, even when it falls on a Saturday or Sunday. The state government last year and the previous year paid the 13th month salary to its workers as Christmas bonus and also pays the pensioners on or before the end of the month. The state even paid June and July salaries last year without receiving federal allocations thanks to increased Internally Generated Revenue, IGR. The government has spent close to N50 billion on road constructions and rehabilitation covering about 450 kilometers in the three Senatorial zones. Enugu State under Ugwuanyi has received accolades for so far empowering up to 2,400 traders with N50,000 each to grow their businesses. The state government has constructed and renovated 589 primary and secondary schools in the state. They have as well procured learning tools and employed more than 4000 teachers; empowerment of 750 youths under the Sustainable Development Goals, SDGs, programme. Under Housing, Enugu State under Ugwuanyi has provided 100 units of one bedroom apartment for 100 lucky civil servants under grade level 1 to 10. There has been rehabilitation of facilities at Ajali and Oji River Water Treatment Schemes which has consequentially improved the supply of water to Enugu metropolis and its environs – 25,000m3 of water is now being supplied daily to Enugu Metropolis from both Ajali and Oji River water schemes. Still on facilities and health, the Agbani District Hospital is ongoing; construction and renovation of district hospitals and health centres in the state, especially in the rural areas under the primary healthcare programme, such as the Poly Clinic, Asata, Enugu and Udi District Hospital. There’s construction of 14 new court buildings and open registries in the judicial divisions and magisterial districts across the state, which the state’s Chief Judge, Hon. Justice Ngozi Emehelu, described as “unprecedented infrastructural development that has not been witnessed in the entire South-East” and “the largest single intervention in infrastructural development in the Judiciary of Enugu State for over 20 years. The two 9th Mile Bypasses in Udi Local Government Area, which have relieved travellers the stress of traffic gridlock in the area, especially during festivities. Since Enugu State was declared open and ready for business, more investors have continued to flood the state for investment opportunities as a result of the existing peace and secure business environment as well as the governor’s commitment to robust investment drive. State-owned higher institutions have not been left out. The governor in his concerted efforts to re-position the foremost Institute of Management and Technology, IMT, Enugu to transit into a degree-awarding institution, recently approved N810 million in addition to over N200 million expended for upgrade of infrastructure in the institute. The Enugu State University of Science and Technology, ESUT; the Enugu State College of Education Technical, ESCET; and the Enugu State Polytechnic, Iwollo, among others, have also been benefitting from the government’s educational transformation programmes. The N10 million “one community, one project” scheme of Governor Ugwuanyi’s administration has also recorded a huge success in expanding development to the frontiers of the rural areas – an initiative that has made it possible for communities that had never experienced any government presence to benefit, accordingly. 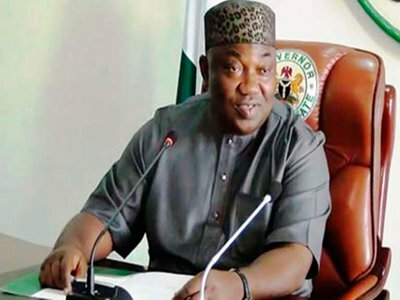 Governor Ugwuanyi – the jinx-breaker, through sheer dexterity and commitment to the success of the Enugu Rangers International Football Club, the Pride of Ndigbo, ensured that the club won the 2015/2016 Nigerian Professional Football League, NPFL title after 32 years in the wilderness without a trophy. The club also won the 2018 AITEO Federation Cup after staging one of the greatest comebacks in Asaba, the Delta State capital. All these landmark achievements earned Ugwuanyi chains of endorsements from virtually all spheres of the society, including the religious institutions, the entire PDP family in the state, leaders and members of opposition political parties, traders, civil servants, artisans, transporters, proprietors and teachers of private schools, Local Government workers, and pensioners, among others. Consequently, the following outstanding ratings and commendations have ensued from the Senate on the judicious utilisation of the bailout funds; the BudgIT report, which listed Enugu, Lagos and Rivers as the only three states out of the 36 states of the federation that have fulfilled obligations to their workers; the recent Economic Confidential magazine verdict that listed Enugu among the seven states that are solvent with impressive over 30 per cent Internally Generated Revenue (IGR) to fund additional economic activities. Others include, the fifth most competitive state in Nigeria, according to the National Competitiveness Council of Nigeria; the third most debt sustainable state in Nigeria; the first state in Nigeria to publish its Audited State/Final Account for consecutive three years; first in the South-East geo-political zone and ninth in the country based on IGR as against Federal Allocation; one of the 12 states in Nigeria that can survive without federal allocations, among others.